In his youth, Dave Thomas was a Korean War veteran working at a small restaurant in Fort Wayne, Indiana when he made the decision to enlist with a different kind of colonel. When Colonel Harland Sanders was trying to expand his Kentucky Fried Chicken business in the mid-1950s, he found the Clauss family, their Hobby House restaurant, and their head cook, Thomas. As the Clausses turned their Hobby Houses into KFCs, Thomas rose through the ranks, and produced suggestions that became every bit as important to KFC's growth as Sanders' legendary "secret recipe": The red-and-white-striped chicken bucket, the revolving sign designed to look like the bucket, and Sanders' appearances in his own commercials. Thomas' suggestions proved so successful that the Clausses sent him to Columbus, Ohio to turn around some of their franchises. By 1968, he was able to sell them back to Sanders for $1.5 million. Frustrated at being unable to find a good hamburger in Columbus, Ohio, in 1969 Thomas started his own chain of hamburger-based restaurants named after his daughter, Melinda Lou. As a child, Melinda Lou had trouble pronouncing her name, and it came out "Wenda." Thomas simplified that in naming his restaurants "Wendy's Old Fashioned Hamburgers." Thomas' initial goal in founding Wendy's was to expand enough so that his five children would all have a place to work during the summertime, but his success far outstripped this modest ambition, and before ten years had passed there were over 1,000 Wendy's locations, and as of 2016, there are over 6,500 locations, still featuring his signature square hamburger patty. Today, Wendy's is the world's third largest hamburger fast food chain. Thomas continued to be involved in day-to-day operations of Wendy's until resigning in 1982. But some misguided decisions, such as an attempt to copy the breakfast menus of McDonald's and Burger King and the cancellation of the "Where's the beef?" commercials starring Clara Peller, led to his being asked to return. By 1989 Thomas was following the advice he'd once given Colonel Sanders, appearing in Wendy's commercials, showing himself to be a regular guy who loved good food and wanted others to have it, suggesting that he took his product, rather than himself, seriously. Thomas appeared in countless Wendy's ads, often in brightly clashing shirts and ties, and set a record for the number of appearances in television commercials. He became every bit as popular as Peller, and an icon on the level of the Colonel and Ronald ​McDonald: A company survey showed that 90 percent of the American people knew who he was. Thomas' success led to several people citing him as a man who had become successful despite being a high school dropout. Thinking that this might lead children to drop out of school, he was bothered by it to the point that he decided to correct what he saw as the greatest mistake of his life, dropping out of high school at 15 to work in the Clauss family restaurant full time. He earned his GED in 1993 after attending classes at a high school near his home in south Florida. 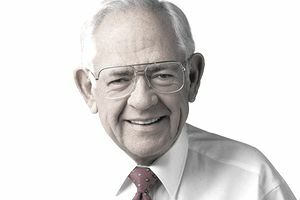 Himself an adopted child, Thomas became active in encouraging foster care adoption in the early 1990s, and in 1992 founded the Dave Thomas Foundation for Adoption. The foundation continues to commit itself to Dave's vision of making sure every child has a permanent and loving family. The Wendy's Company continues to partner with the Foundation to help children in foster care find permanent homes. Dave Thomas remained involved with Wendy's until liver cancer began to take its toll. He died in 2002, at the age of 69. His children remained involved with the company, and in 2011, his daughter, Melinda Lou Morse, began to appear in commercials for the chain that, in a way, bears her name, to promote "Dave's Hot 'N Juicy Cheeseburgers," extending her father's personal and business legacies.